This book covers the syllabus for the “Improving the Test Process” module of the International Software Testing Qualifications Board (ISTQB). It is an essential guide to test process improvement and the related ISTQB expert level exam; reader will benefit from the knowledge and experiences of the authors of the ISTQB expert level syllabus “Improving the Test Process”. 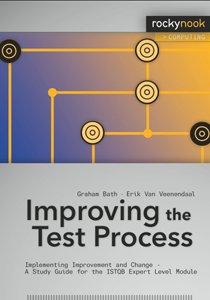 This book will give your a thorough understanding of how to approach test process improvement from two fundamental standpoints: the process itself and the people issues concerned with improving the testing process. It’s not a book about using model XYZ or applying technique ABC; it considers test process improvement itself as a process, with a wide range of options, choices and interactions. This book can be used both as a preparation aid for those planning to take the ISTQB expert level exam and as a practical guide for experienced test professionals who want to develop their skills in improving test processes. an explanation and guide to the ISTQB expert level exam.